I’m beyond analyzing Miguel Cabrera. His offensive ability is so good that it is boring. There’s nothing left for me to say. He’s off the charts incredible. Clearly the best hitter of the moment, and starting to push his way into conversations with the words “era,” “generation,” and “ever.” You know the drill. Let’s consider his amazing 2013 season. All statistics as of the start of play on August 13. 1. By Weighted Runs Created Plus or wRC+ (what’s wRC+? ), Cabrera is having the 15th best offensive season in baseball history. Every player on the list ahead of him is an inner circle Hall of Famer or is Barry Bonds. Ruth, Williams, Bonds, Hornsby, and Mantle are the only players in history with even one season of 210 wRC+ or better. 2. Cabrera is having the best offensive season of his career by far, obviously, but did you know it’s 33% better than his previous high and 44% better than the year he won the Triple Crown? 3. This is the best offensive season in Tigers history, besting Cobb’s 1910 by 4%. 4. Miguel Cabrera is having the 2nd worst defensive season in his career by UZR (what’s UZR? ), but is still already a half a win better by WAR (what’s WAR?) than his previous high despite there being 45 games left in the season. 5. Using Weighted On Base Average (what’s wOBA? ), because it’s easier for me to calculate, if everyone else in the league stayed on their current pace, Cabrera would have to go 0 for his next 50 in order for Chris Davis to catch him. If Cabrera didn’t get a hit in the next 12 games, he’d still be the best hitter in the league. 6. Cabrera could go 0 for his next 25 and still have a higher OBP than Joey Votto has right now. Votto has baseball’s second best OBP. 7. If Cabrera went 0 for his next 70, he would still be second in baseball in slugging percentage. 8. The ZIPS projection system estimates Cabrera will get 185 more plate appearances before the season is over. If he made an out during every one of them he would still have the 39th best OPS in the league at .812. The only players on the Tigers with an .812 OPS or better right now besides Cabrera are Peralta (.822 in 436 PA), Tuiasosopo (.919 in 144 PA), and Doug Fister (1.333 in 4 PA). 9. Cabrera currently has the best batting average of his career by 22 points, best OBP by 9 points, and bests SLG by 70 points. He’s 8 HR shy of setting a new career high. Since the start of 2009, he leads baseball in HR, R, RBI, AVG, SLG, wOBA, wRC+, and WAR. He trails Votto by .009 in OBP. 10. Among players with fewer than 7,000 career plate appearances only 6 have more career WAR than Cabrera. 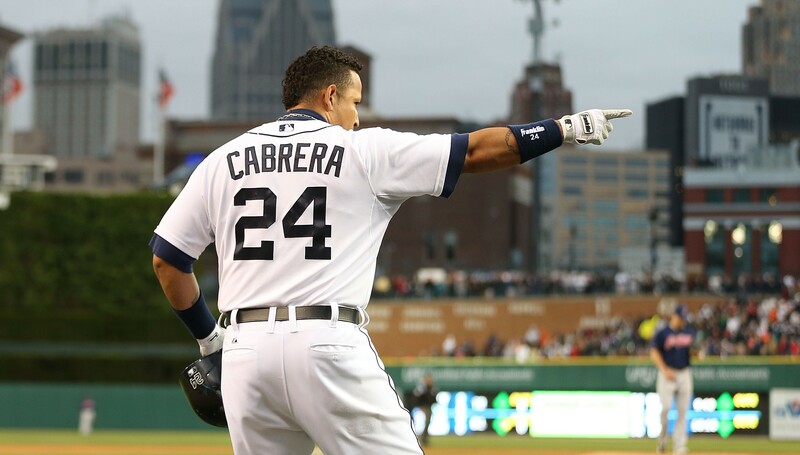 By wRC+, Miguel Cabrera is the 25 best hitter in baseball history at 153 for his career.